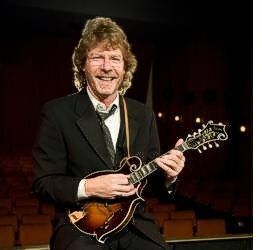 Sam Bush will be awarded the "National Award." Bowling Green native and multiple Grammy Award winner Sam Bush has energized audiences and inspired generations of acoustic musicians by pushing the boundaries of traditional bluegrass to create an exciting blend of bluegrass, jazz, rock 'n' roll and soul. As a toddler, he was exposed to his father's own bluegrass collection, and by age 11 he took up the instrument that he has been identified with for his more than five decade career - the mandolin. Bush's musicianship at what has since been called "Newgrass" has led to collaborations with other big name artists like Leon Russell, Lyle Lovett, Emmylou Harris, Alison Krauss, Tony Rice, Dolly Parton and Doc Watson. He demonstrates as much mastery of live venues as he does recording studios, and is a frequent artist at well-known venues like the Telluride Bluegrass Festival in Telluride, Colorado, Merlefest in Wilkesboro, North Carolina, and the Lonesome Pine Special Concert Series in Louisville. "It's been my special privilege these past eight years to bestow this honor on many deserving artists and friends of the arts in Kentucky, and these honorees continue that fine tradition," Beshear said. "It is especially poignant to do so in this, the 50th anniversary year of the Kentucky Arts Council. Looking back through the history of the Governor's Awards winners, you can see many outstanding examples of the high level of art in Kentucky." The Governor's Awards in the Arts are presented in nine categories. The Milner Award is the first award given and is considered the most prestigious of the nine. A date has not yet been set for the 2015 Governor's Awards in the Arts, but it will be posted on our website when it has been confirmed. Nominations for the Governor's Awards in the Arts are accepted annually from the public. The deadline to make a nomination for the 2016 awards is Nov. 1, 2015. The Kentucky Arts Council coordinates the nomination and selection process for recommendation to the governor. The Kentucky Arts Council, the state arts agency, fosters environments for Kentuckians to value, participate in and benefit from the arts. Kentucky Arts Council funding is provided by the Kentucky General Assembly and the National Endowment for the Arts. The arts council, along with the NEA, is celebrating 50 years of service in 2015, which the arts council is recognizing as the Year of the Arts in Kentucky.